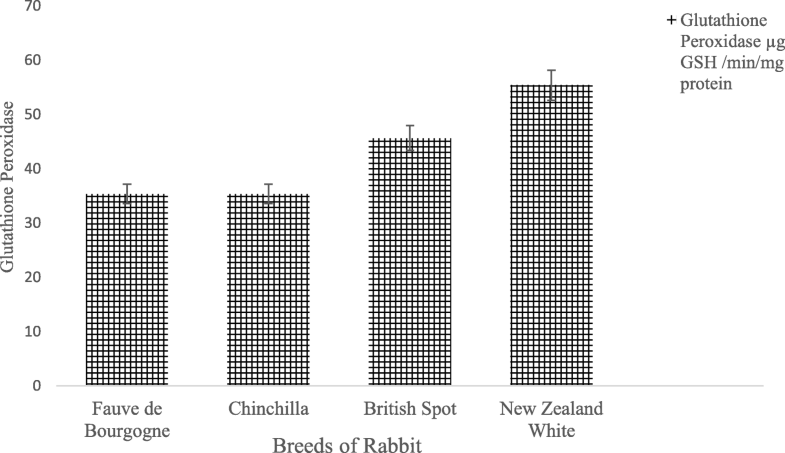 Within the rabbit population in Southwest of Nigeria, four breeds of rabbits consisting of Fauve de Bourgogne, Chinchilla, British Spot, and New Zealand White were evaluated for their oxidative status, as indices of physiological adaptation for optimal productivity. This investigation was carried out within July and August when least temperature-humidity index (THI) is observed in Ibadan, Southwest Nigeria. Thirty bucks per breed were housed individually and randomly allotted to experimental units. Blood samples were collected from all bucks and serum obtained using standard procedures. Serum oxidative stress indicators assay include total antioxidant capacity, lipid peroxidation, superoxide dismutase (SOD), catalase, and glutathione peroxidase activity was determined using standard procedures. Results revealed that serum lipid peroxidation, total antioxidant activity, catalase, and glutathione peroxidase were not significantly (p > 0.05) affected by the breeds of rabbit. Fauve de Bourgogne, Chinchilla, and New Zealand White had statistically similar serum SOD activity and were significantly (p < 0.05) higher than serum SOD activity of British Spot rabbits. This shows that British Spot has the least superoxide anion scavenging ability across the breeds. 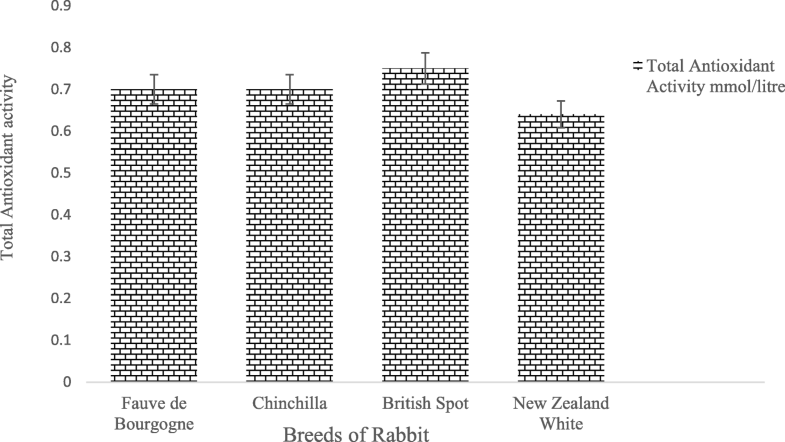 The breeds of rabbit assessed have similar oxidant generation capacity and antioxidant production, except British Spot that has the least superoxide scavenging which could increase oxidant accumulation within this breed of rabbit. The blood is easily and often influenced by the external environment including feeding practices, ambient temperature, type of shelter, and many other aspects of herd management since they are intimately related to metabolism (Marai and Habeeb 1998). Reactive oxygen species (ROS), the major culprits for causing oxidative stress, are constantly generated in vivo as an integral part of metabolism. ROS may cause oxidative stress when their level exceeds the threshold value. They trigger the progressive destruction of polyunsaturated fatty acids (PUFA), ultimately leading to membrane destruction (Kumar et al. 2011). The highly reactive hydroxyl radical is especially toxic because it can react with proteins, polysaccharides, nucleic acids, and polyunsaturated fatty acids and cause alteration of their structure and functions (Daniel et al. 2005). It is widely accepted that mitochondrial respiration is the primary source of reactive oxygen species (Turrens 2003), with 0.2 % of oxygen consumed converted into superoxide in the normal state (St. Pierre et al. 2002). Levels of ROS are determined by production and by the rate of ROS degradation and/or inactivation, an appropriate balance is important for maintaining cellular homeostasis (Jimoh 2016). Although low levels of ROS are essential in many biochemical processes, accumulation of ROS may damage biological macromolecules, i.e., lipids, proteins, carbohydrates, and DNA (Kumar et al. 2011). External factors such as heat, trauma, ultrasound, infections, radiations, toxins, etc., can lead to increase free radicals and other ROS and may lead to oxidative stress (Halliwell et al. 1992). Oxidative stress is considered to play a pivotal role in the pathogenesis of aging and several degenerative diseases, such as atherosclerosis, cardiovascular disease, type 2 diabetes and cancer (Storz 2005). The paucity of information exists on oxidative stress indicators of rabbits under climatic conditions of West Africa. It is important to document oxidative indicators in rabbit breeds in Nigeria, especially reports on thermal comfort conditions which could serve as the baseline for interpretations, diagnosis, and evaluating environmental contributions to oxidative stress in the tropics. The research was carried out at the rabbit unit of Teaching and Research Farm and Animal Physiology Laboratory, Department of Animal Science, both of the University of Ibadan, Ibadan, Nigeria. It is situated in the rainforest agro-ecological zone of Nigeria, between lat. 7° 27′ 18.74″ N and 7° 27′ 19.17″ N and long. 3° 53′ 13.98″ E and 3° 53′ 32.69″ E.
Four exotic breeds of rabbit consisting of Fauve de Bourgogne, Chinchilla, British Spot, and New Zealand White were used for the study. At the commencement of the trial, animals were confirmed to be of good health status, without abnormalities, and conform to the breed and/or age group categorization. Thirty bucks per breed were used, animals were housed individually, and allotted randomly into experimental units in a completely randomized design. The animals were fed 5 % of their body weight, with diets containing crude protein 17.05%, digestible energy 2592.06 Kcal/kg, crude fiber 10.02%, calcium 0.45%, and phosphorus 0.21%. Freshwater was available to the animals always. Other routines and periodic management practices necessary for rabbit production were carried out. This experiment was carried out when least Temperature Humidity Index is observed in the study area (within July and August), which depicts the highest thermal comfort in the study area (Jimoh and Ewuola 2018). Blood samples were collected from all bucks through the ear vein into plain sample bottles and were centrifuged at 3000 rpm for 15 min and supernatant separated as serum.Serum biochemical constituents were determined using spectrophotometric procedure; total protein, glucose, total cholesterol, sodium, chloride, phosphorus, magnesium, and potassium contents of the samples using commercial assay kits. Serum oxidative stress indicators assay include total antioxidant capacity, lipid peroxidation, superoxide dismutase, catalase, and glutathione peroxidase activity. Where CUA (mmol/L); concentration of uric acid. A: absorbance of the sample (A1 − A0). The assay for lipid peroxidation; the reaction mixture in a total volume of 3.0 ml contained 1.0 ml serum and 1.0 ml of TCA (0.67%). All the test tubes were placed in a boiling water bath for a period of 45 min. The tubes were shifted to the ice bath and then centrifuged at 2500 rpm for 10 min. The amount of malondialdehyde (MDA) formed in each of the samples was assessed by measuring the optical density of the supernatant at 532 nm (Ohkawa et al. 1979). Superoxide dismutase (SOD); 2.1 ml of 50 mM buffer, 0.02 ml of enzyme source, and 0.86 ml of distilled water. The reaction is initiated with 0.02 ml of 10 mM pyrogallol and change in absorbance monitored at 420 mm. One unit of SOD is defined as that amount of enzyme required to inhibit to auto-oxidation of pyrogallol by 50% in the standard assay system of 3 ml. The specific activity is expressed as unit/min/mg protein (Soon and Tan 2002). Glutathione peroxidase activity; 0.5 ml of 0.4 M buffer, pH 7.0, 0.2 ml enzyme source, 0.2 ml of 2 mM GSH, and 0.1 ml of 0.2 mM H2O2 were added and incubated at room temperature for 10 min along with the control tube containing all reagents except enzyme source. The reaction arrested by adding 0.5 ml of 10 % TCA, centrifuged at 4000 rpm for 5 min, and the GSH content in 0.5 ml of supernatant was estimated. The activity expressed as microgram of GSH consumed/min/mg protein (Rotruck et al. 1973). Catalase activity; the assay system contains 1.9 ml of 0.05 M buffer, pH 7.0, and 1.0 ml of 0.059 M H2O2. The reaction is initiated by addition of 0.1 ml enzyme source. The decrease in absorbance is monitored at 1 min interval for 5 min at 240 nm, and activity is expressed as nanomoles of H2O2 decomposed/min/mg protein (Beers and Sizer 1952). Data obtained in this study was subjected to one-way analysis of variance of general linear procedure (SAS Institute Inc 2003), significant effects were detected with a confidence level of 95%, and New Duncan’s multiple range test of same software was used to separate means. The serum biochemical indices of four rabbit are presented in Table 1. All parameters assessed were not significantly (p > 0.05) affected by the breed of the rabbits. The result obtained showed that serum biochemicals were not affected by breed differences, indicative of similar physiological status across the breeds. The serum lipid peroxidation of four breeds of rabbits at least THI in Ibadan is shown in Fig. 1. Lipid peroxidation was not significantly (p > 0.05) affected by the breeds of rabbit. However, British Spot had apparently the highest values among the breeds. Serum total antioxidant activity of the rabbits was not influenced significantly by breed differences as revealed in Fig. 2. Apparently, British Spot had the highest value among the breed for total antioxidant activity. Serum superoxide dismutase activity was significantly (p < 0.05) different across the breeds as shown in Fig. 3. Fauve de Bourgogne, Chinchilla, and New Zealand White had statistically similar serum SOD activity and were significantly (p < 0.05) higher than British Spot rabbits. Serum catalase activity of New Zealand White rabbits was apparently highest compared with other breeds, but no significant (p > 0.05) difference was observed across the breeds as shown in Fig. 4. Serum glutathione peroxidase was not significantly affected by the breeds of rabbits as shown in Fig. 5. The serum biochemical indices were assessed at least in Temperature Humidity Index which is indicative of thermal comfort. The obtained result showed that serum biochemical indices were not affected by breed differences, indicative of similar physiological status across the breeds. The animals had only one source of variation (breed), and the environmental conditions were indicative of thermal comfort in the study area. It can be suggested that the rabbit breeds have similarities in physiology under normal conditions. The ranges of obtained values were in agreement with values reported by Ahemen et al. (2013), Odetola et al. (2012), and Ewuola et al. (2012), and were within the normal range of biochemical values as reported by Mitruka and Rawnsley (1977) and Duncan and Prasse (1986). 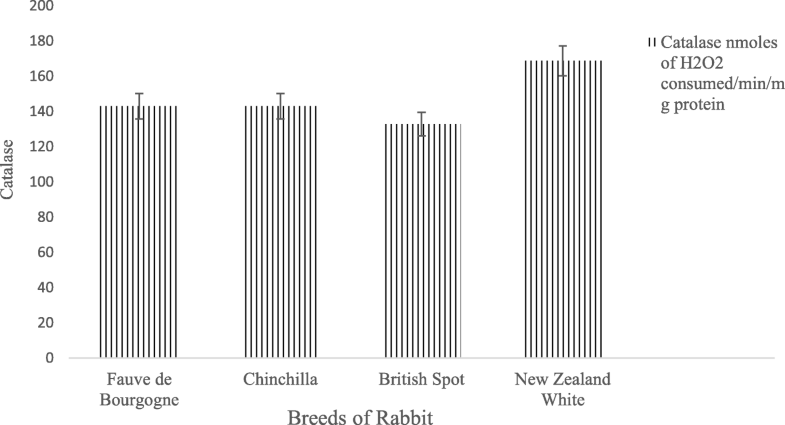 British Spot rabbit had apparently highest values among the breeds; this suggests low antioxidant defense against free radical species metabolites, thus predisposing the animals to oxidative stress. Serum total antioxidant activity of the rabbits was not influenced significantly by breed differences. Similarly, British Spot had the highest value among the breeds for total antioxidant activity. 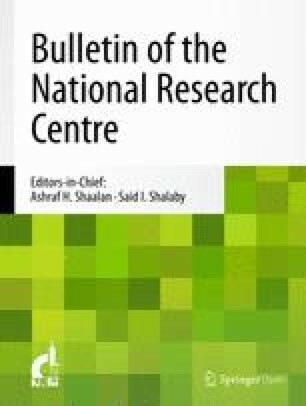 This suggests that the lipid peroxidation in British Spot may be due to the deficit in certain free radical species metabolites scavenger (antioxidant) in the serum of the animals, but the other substrates elimination were high due to the activity of their systemic scavenger (antioxidant). Lipid peroxidation is a result of the combined effect of different free radicals and metabolites. The elimination of certain free radical/metabolites may not reduce the precipitation of the others that are active. Total antioxidant activity measures the combined activity of enzymatic and non-enzymatic antioxidants which act on specific substrates: superoxide dismutase (superoxide anion), catalase, and glutathione peroxidase (hydrogen peroxide). High total antioxidants activity could be due to the activity of one or more component antioxidants. 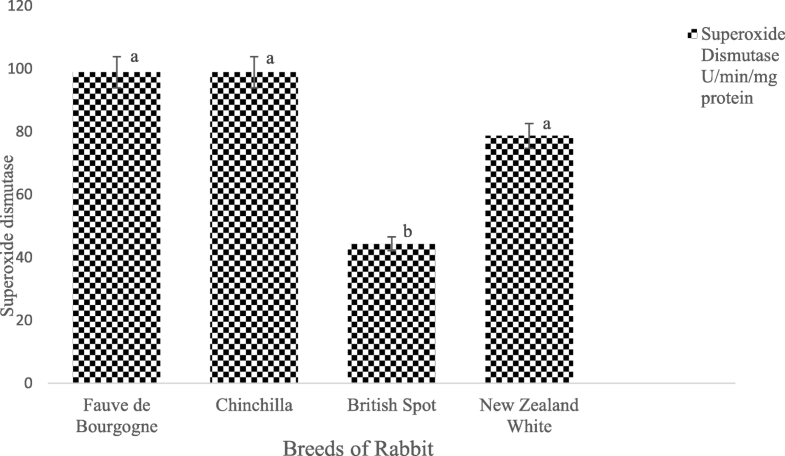 Fauve de Bourgogne, Chinchilla, and New Zealand White had statistically similar serum SOD activity and were (p < 0.05) higher than British Spot rabbits. This confirms the earlier suggestions that British Spot has low superoxide dismutase anion (free radical species) scavenging ability, and the accumulations of the superoxide anion account for high-lipid peroxidation and subsequent oxidative stress in the animals. 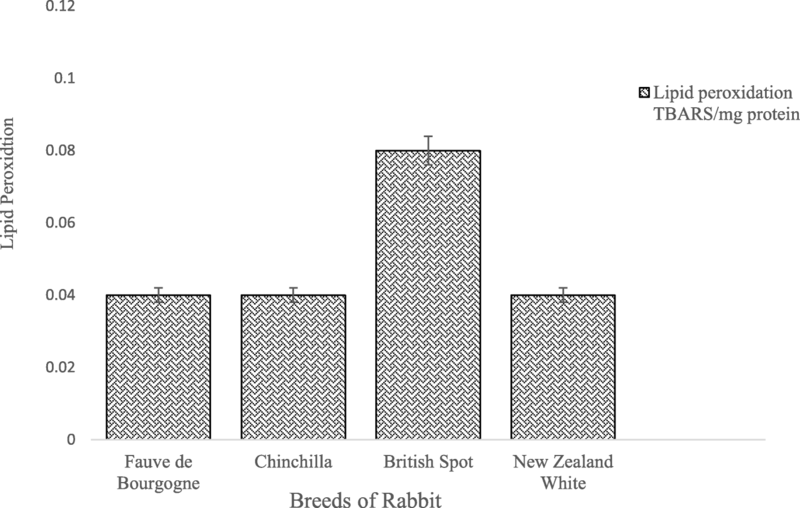 The catalase and glutathione peroxidase activity of British Spot was similar, though values were apparently (p > 0.05) lower than New Zealand White, but were (p > 0.05) higher than Chinchilla and Fauve de Bourgogne. The body’s total antioxidant capacity serves to protect cells from excess production of ROS (Bloomer and Fisher-Wellman 2008; Brennan and Kantorow 2008). The reactive oxygen species contribute to an intensified synthesis of antioxidant enzymes in tissues and hence their elevated activity may be a manifestation of adaptation mechanisms in response to oxidative stress. A decreased activity of antioxidant enzymes or a decreased non-enzymatic antioxidant concentration may be caused by their intensified utilization in protection against oxidative tissue damage (Seven et al. 2001). The great majority of the energy released under basal conditions is used by the cell for the maintenance of the Na+-K+ dependent ATP-ase activity. This increased the use of ATP associated with the intensification of oxygen consumption by the oxidative phosphorylation pathway that generates reactive oxygen species (Sies 1997). The study reveals that the four breeds of rabbit have similar oxidative status. However, British Spot has low superoxide dismutase scavenging ability and could pose danger to lipid peroxidation at high metabolic or physiological conditions. This serves as reference values for oxidative status and interpretation of different condition for the rabbit breeds. The authors are grateful to the management and staff of the Rabbitry Unit, Teaching and Research Farm, University of Ibadan, for their assistance in providing animals and housing for this work. Also, Dr. Ajayi Babajide Oluwaseun of Biochemistry Department, BOWEN University, Iwo, Osun State, Nigeria is appreciated for his technical assistance in oxidative status assay procedures and chemicals used. OAJ designed, carried out the field work, and supervised the study, carried out the statistical analysis, and wrote the manuscript. The author read and approved the final manuscript. Department of Agricultural Technology, Federal Polytechnic Ado Ekiti, Ekiti State. Nigeria. The study was undertaken with approval from the institutional ethics committee for care and use of animal for research of the host institution.